After his historic first ascent of Mt. Everest, Sir Edmund Hillary famously said, “It’s not the mountain we conquer, but ourselves.” Hillary measured his and Tenzing Norgay’s great feat not by the act of stepping foot into a previously unexplored physical realm, but rather by their leap into the unknown depths of their own psyches—to discover what happens when one commits to stepping out of their comfort zone. Stepping Out of the comfort zone in many ways, is best facilitated through outdoor adventures. However, in today’s engagement-hungry and validation-fueled society, “showcasing where you’ve been” has become more important than seeking the unknown—a mindset that is causing countless people to rob themselves of potentially life-changing experiences by simply following the trends. This practice poses the question: Have we as a society become too comfortable and contempt with the familiar? How could we be affected if we sought to experience more? Join our team as they seek to answer those questions while striving to #CelebrateDiscomfort on a series of epic adventures in Alberta. At the core of these stories are two people with heart. Chris Brinlee, Jr. and Christian Lanley met for the first time in the Alps; their bond was quickly concreted on classic climbs like the Matterhorn, the Aiguille du Midi, and the Eiger—on the latter of which they experienced an unplanned bivy at 12,000’. They survived the night tied to each other on the side of one of the world’s deadliest mountains—borderline hypothermic while shivering in the bitter cold; sharing an emergency bag. They made it out unscathed though; the result was a bond forged not by fire, but by ice. A craftsman of content, a madman behind the lens, and an all around machine: Chris Brinlee, Jr. carries his tools deep into the Alps and other great mountain ranges around the world and returns with stunning shots and stellar stories to go with them. His beard is as fiery as his passion for his art. He also does a mean Aldo Raine impression. At least it might be an impression. It could very well be his actual voice. You may never know. A lover of long walks on the beach and fruity drinks... Wait a second... Christian Lanley likes to suffer in the alpine. His favorite things are getting sandbagged by SummitPost with bad beta before tackling deadly climbs. He eats gummy bears for breakfast to feel the protein and sugar rush through his hot blood while scaling great mountains during all hours of the day and night. Christian doesn't quit, even when every ounce of his flesh hates him and tells him to stop. He's hard. Hard like the icy walls upon which his two tools bring great wrath with every single strike. And he don't drink no fruity drinks. He drinks water and beer. Not necessarily in that order, either. At the heart of Alberta is the Canadian Rockies; their glaciated peaks form one of the most rugged mountain ranges on earth. Most people traveling to Alberta’s Rockies from afar will fly into Calgary International Airport (YYC.) Nonstop flights from Los Angeles are just over three hours long, nonstop from Dallas is about four; nonstop from New York City is five. From there, it’s a mere hour-long drive to Canmore, whose rugged skyline is defined by The Three Sisters. The team spent March 2017 in Alberta, tackling objectives from a variety of disciplines including technical alpinism, ski mountaineering, alpine touring, traditional mountaineering, and ice climbing; their adventure will conclude with an attempt on a highly-visible, yet unconquered alpine traverse. These objectives will provide the context and environment in which to #CelebrateDiscomfort. The Wapta Traverse is the ultimate Canadian Rockies hut to hut ski tour. The Wapta Icefields spread for many miles north along the continental divide from the Lake Louise area. With vast glaciers, easy peaks and a superlative hut system, the Wapta has been described as the greatest ski tour in North America. Chris & Christian joined Yamnuska Mountain Adventures and tackled it during a full-on whiteout; what their trip lacked in views, it made up for with opportunities to #CelebrateDiscomfort. Alberta's Rockies offer some of the best ice climbing in the world. In addition to long and challenging multi-pitch routes, there are fantastic beginner crags and climbing areas, many of which can be top-roped, and accessed with a short approach - making Alberta a world-class ice climbing destination with something for everything. Chris & Christian joined Yamnuska Mountain Adventures' program director Paul Chiddle on a climb of The Sorcerer - which could very well be the best ice climb in the entire world. Before embarking on their journey north into the Canadian Rockies, Content Machine partnered with several brands to host Stepping Out: The Contest. The contest challenged entrants to answer the question: "How do you #CelebrateDiscomfort?" More than 1,500 submissions were received; one winner was chosen to join Chris & Christian on an all-expenses paid expedition to ski Alberta's Mount Castleguard. 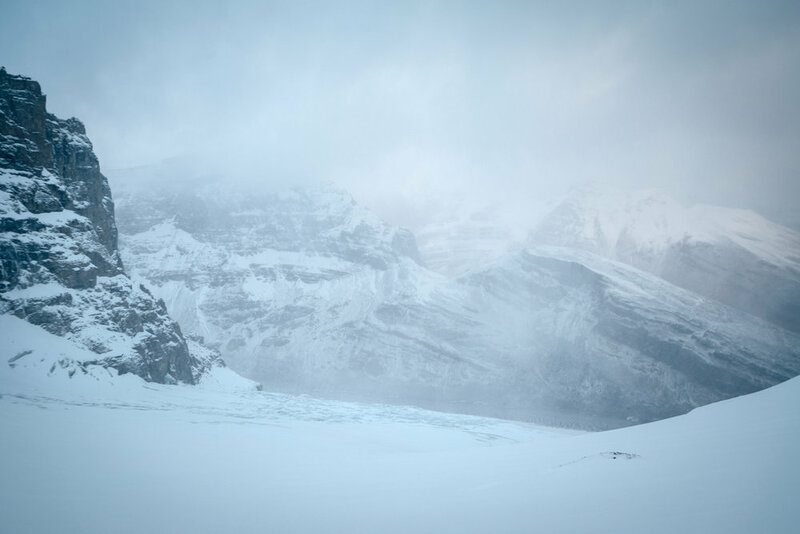 The Endless Chain Ridge is a 16-mile long ridgeline that defines a great portion of the skyline along Alberta's Icefields Parkway. Despite its prominent nature and seemingly easy access, the ridgeline had never been traversed - until Chris & Christian set out to tackle it on a journey into the unknown. 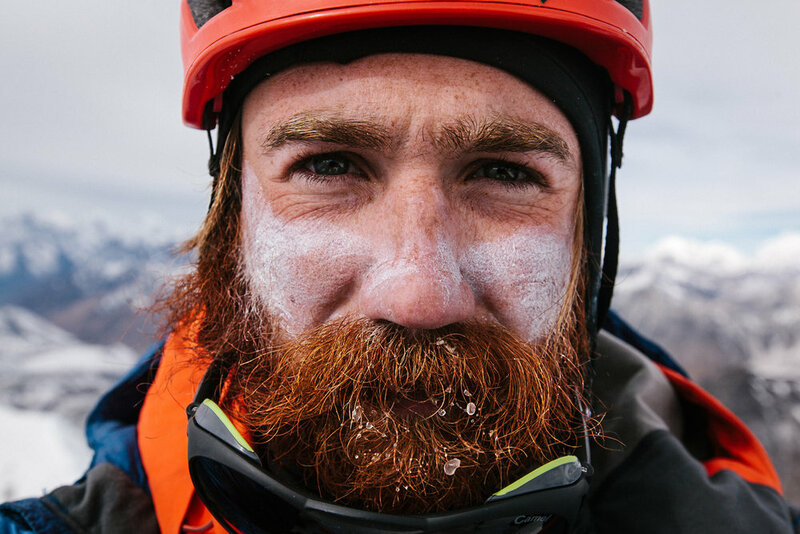 Join adventurers & storytellers Chris Brinlee, Jr. and Christian Lanley as they travel to Alberta in search of experiences that will enable them to #CelebrateDiscomfort. 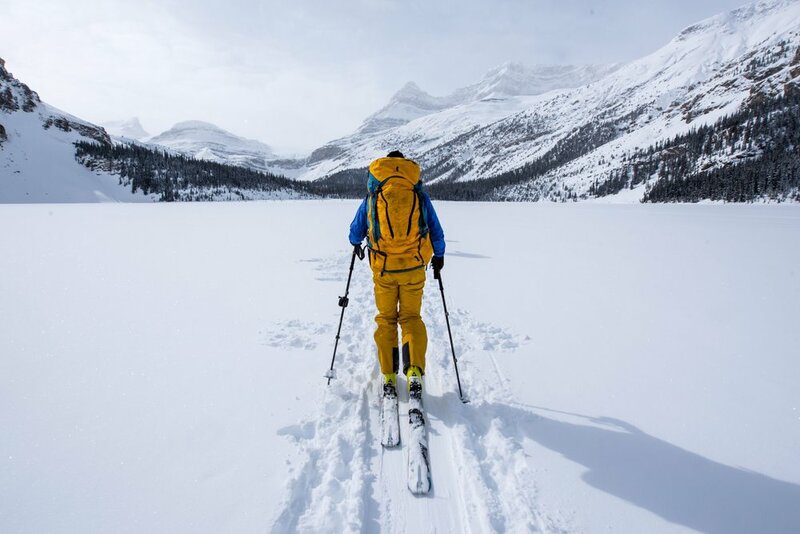 Join Chris and Christian as they take on Alberta's famed Wapta Traverse, which is often described as the most remarkably beautiful ski traverse in North America. Chris and Christian partnered with their sponsor Cotopaxi, along with a couple of other brands, to hold a contest; the winner joined them in Alberta for a trip with Yamnuska Mountain Adventures. This is that adventure. Gear provides the backbone of an expedition; it can make or break a trip. A such, the team has carefully curated this collection of apparel and hardware based on their specific needs and style. This is what they use, why they use it, and where to buy it. The Nepal 75 is Cotopaxi's biggest, most fully-featured load-hauler. 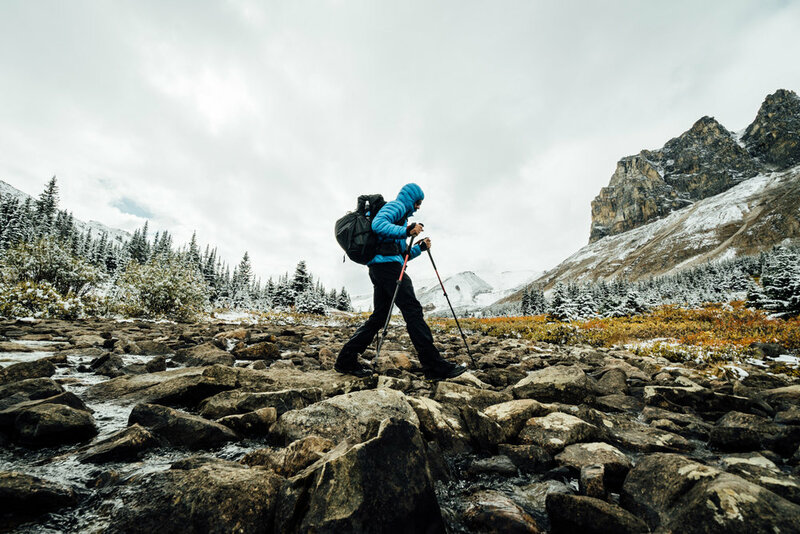 It can easily handle all of the gear needed for multiple days in the backcountry - summer, or winter; it carries those loads with ease thanks to its robust and fully-adjustable suspension system. Chris & Christian have used it in alpine environments all over the world, including Alaska, Greenland, and now, the Canadian Rockies. It's tough, has plenty of pockets for organization, and it matches yellow ski pants. The Salewa Vultur Vertical GTX mountaineering boots were designed for confident movement through technical alpine terrain, vertical ice, and mixed climbing routes. They achieve this with a completely waterproof Gore-Tex lining, an aggressively-lugged Vibram outsole, burly uppers, and flexible ankles - the latter of which offer mobility while remaining supportive. Break-in period on the Vultur Vertical GTX took a bit, but they were the most comfortable and confidence-inspiring mountaineering boots that Chris had ever worn. Revo has been making high-end performance glasses in Italy since 1985; the Traverse is its first foray into the glacier glasses market. At first glance, you might not even realize they were created with alpinism in mind. The lenses, which come in bright orange or blue, are a classic aviator shape wrapped in a matte plastic frame. Stylish perforated-leather shields wrap the sides, and rubberized temples and nose pads hold them in place while climbing. Put simply, they perform as great as they look. Chris & Christian have worn the Traverse while climbing all over the world. They are effective at keeping the sun and glare out of the eyes, are comfortable to wear, and they don’t fall off. The REVO Pike Goggles offer maximum peripheral vision thanks to their bold, rimless design. The lenses are photo chromatic (meaning that they automatically adjust to various lighting conditions,) polarized (to reduce glare) and feature an anti-fog coating - to ensure that they go as hard as you do. Thanks to those features, they are incredibly versatile; Chris & Christian trust them on every winter mission in the alpine. Stepping Out has only been possible with their support.